According to the European Food Safety Authority, human campylobacteriosis is the most reported human food-borne illness in the Union with around 230 000 cases reported annually. According to a survey carried out at slaughterhouse level in 2008, broiler carcases were contaminated at an average of 75,8 %, which leads to a 20 % to 30 % of human campylobacteriosis by the handling, preparation and consumption of broiler meat, while 50 % to 80 % can be attributed to the chicken reservoir as a whole. 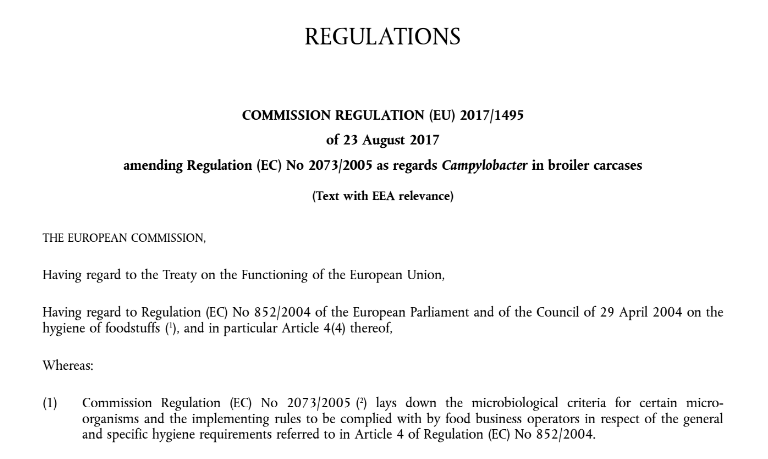 Considering all this, a European commission regulation has been just adopted to include the food category « Carcases of broilers » for the control of Campylobacter using the analytical reference method (EN ISO 10272-2). ISO 10272 indicates the use of a charcoal-based selective media or a blood containing media. These culture plates are incubated for up to 72 hours and their lack of selectivity allows for the growth of large amounts of flora. Therefore, the ISO indicates the use -in parallel- of a second medium to palliate these deficiencies. CHROMagar™ Campylobacter was specifically designed to comply with this ISO, as a chromogenic medium both selective and differential for the isolation of this enteric pathogen. Distinct red colonies of Campylobacter will grow after 24 hours.